To foster intellectual honesty, with regard to undergraduate research, all academic units at UCR are encouraged to develop statements that fit the distinctive research climate and needs of their individual disciplines. These guidelines may cover responsibilities of research supervisors, assignment of credit for publications, training of research apprentices, requirements for record keeping of experimental procedures and data storage. Faculty members, teaching assistants, and other instructional personnel are encouraged to include statements addressing academic integrity as part of the syllabus for every course and to educate students about expectations and standards in the context of the course in order that students may not, through ignorance, subject themselves to the charge of academic misconduct. Instructors are further encouraged to inform students of campus resources available for dealing with academic difficulty. Throughout the process of reviewing allegations of academic misconduct, this policy articulates deadlines for action based on calendar days. If the day of a deadline falls on a weekend, holiday, or day the University is otherwise closed, that deadline will be moved to the next day the University is open. In all cases an effort will be made to appoint members who represent the disciplinary diversity within each college/school, whenever possible. Staff support to the committees will be provided by the office of the Vice Provost for Administrative Resolution, the office of the AVC/Dean of Students, and SCAIP. SCAIP will schedule a hearing panel of three to five members, from the relevant AIC for each case. A quorum of the committee consists of three persons, with at least one faculty member and one student for School or College Committees. In the absence of a quorum, the hearing will be rescheduled. Staff support to the Committee will be provided by the Vice Provost for Administrative Resolution or his/her designee. The purpose of an Academic Integrity Committee Hearing is to explore and investigate the incident giving rise to the appearance of academic dishonesty, and to reach an informed conclusion as to whether or not academic dishonesty occurred. In keeping with the ultimate premise and justification of academic life, the duty of all persons at a hearing is to assist in a thorough and honest exposition of all related facts. A hearing is not in the character of a criminal or civil legal proceeding. It is not modeled on these adversarial systems; nor does it serve the same functions; rather, it is an academic process unique to the community of scholars that comprise a University. The Vice Provost for Administrative Resolution or his/her designee will serve as a non-voting administrative chair to facilitate the hearing. The administrative chair shall rule on all questions of procedure and evidence, including but not limited to: the order of presentation of evidence, admissibility of evidence, applicability of regulations to a particular case, and relevance of testimony. Preparation: Prior to the hearing, panel members will receive and review a copy of the notification of charges and documentary evidence provided by the instructor, the University, and the student. Introductory comments: At the beginning of the hearing, the administrative chair will ask all present at the hearing to introduce themselves for the record. The administrative chair will ask any panel members to disqualify themselves from participation if they believe for any reason that they cannot render a just and fair decision and will permit the student to request that a member be disqualified if the student believes for an appropriate reason that a panel member cannot render a just and fair decision. If a student or faculty member of the hearing panel is disqualified, another member will be appointed to fill the same role, if needed for a quorum. 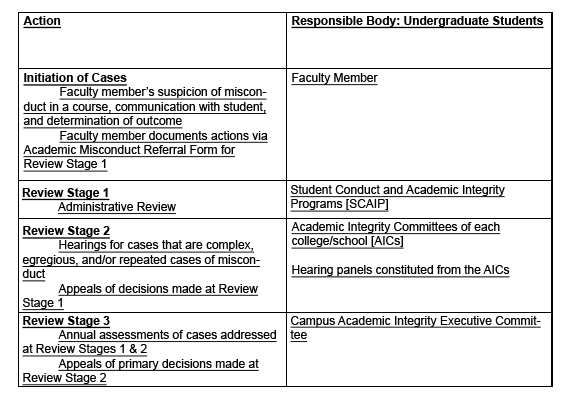 The chair will read aloud the charges of academic misconduct and the student will be asked to respond to the charges by (a) accepting responsibility, (b) accepting responsibility and noting that there are mitigating circumstances, or (c) denying responsibility for the alleged violation of the University of California Policy on Student Conduct and Discipline. Presentation of accounts: The faculty member and the student will be given the opportunity to present their accounts of the incident and present any witnesses or other individuals who may have relevant information about the alleged academic misconduct. Hearing panel members will be given an opportunity to ask questions of the faculty member, the student, and witnesses. Each party will then be asked if there is additional information needed, or if any discrepancies or questions need to be presented or addressed. Deliberation: The hearing panel will deliberate in private to decide, by a majority vote, if a preponderance of the evidence indicates that the student is responsible or not responsible for alleged violation of University of California Policy on Student Conduct and Discipline. If the student is found to be responsible for violations of the Policy, the Committee shall be informed of the student's prior record to determine whether the student has been found responsible for previous academic misconduct. Based on this information, the Committee will determine the sanction(s) to be assigned. Notification of decision: Once the hearing panel has reached a decision, the parties involved will reassemble, and the results of the deliberation will be presented. Within 20 calendar days, the Vice Provost for Administrative Resolution or his/her designee will send written notification to the student, the faculty member, and the dean or his/her designated associate dean for student academic affairs of the college/school detailing the decision and the sanctions imposed by the hearing panel. The notification will also outline the appeal process. Records: An audio recording of the hearing, but not the deliberations, shall be made and retained in SCAIP as part of the record for as long as the disciplinary record is retained, or for seven years from the date of decision, whichever is shorter (see Section F below). The student may obtain a copy of the recording upon paying the expense of making such copy. Either the student with conduct under investigation or the faculty member may arrange for a stenographer to make a full transcript of the proceedings at his/her own expense. If one party has the proceedings transcribed, arrangements shall be made before the hearing as to how to apportion the cost if both parties want copies. Other than for the purpose of the official record as provided above, mechanical or electronic devices for recording or broadcasting shall be excluded from the hearing. SCAIP shall serve as the central location where all written, audio, and electronic records of incidents of academic misconduct are kept on file. The records will be readily available for review by the Deans and Associate Deans of each College or School, the Dean of the Graduate Division, the Executive Vice Chancellor and Provost and the Vice Provost for Administrative Resolution, in accordance with legitimate educational interest criteria as articulated by the Family Educational Rights and Privacy Act.